Veggies can be hard to incorporate into your kids' diet - who am I kidding? They are hard to incorporate in my own diet. Mike is more of a Meat-and-Potatoes kind of guy, and I'm a Pasta-for-Every-Meal kind of gal, so we are often finding ourselves vegetable starved. This healthy vegetable soup is just what we need to get us back into the nutrient rich world. Vegetable soup can be a hard sell on kids. I can't remember ever being excited when my Mom said we were having vegetable soup for dinner. It was just one of those menu items that was 'fine' but not something that I would have requested. It is not like anyone would pick vegetable soup for their birthday dinner. Soups become more appealing to kids when they're paired with something like grilled cheese, or... pizza. Pizza? Yes. 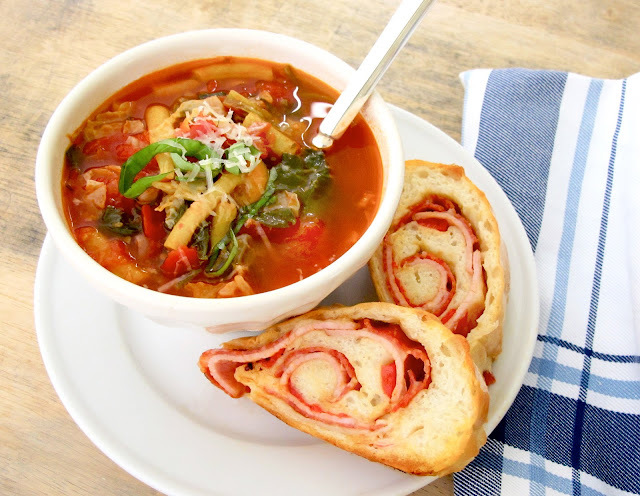 This Italian Vegetable Soup is the perfect complement to Pizza Bread - what kid wouldn't be excited about something called Pizza Bread? Wait, what is Pizza Bread? Here is the link to learn all about this mysterious wonder that I'm pretty sure my Mom made up... and was one of our favorites when we were younger. It was probably even requested for a birthday dinner or two. I'm always so shocked how quick a soup comes together. Unlike popular belief, soups don't take hours (or skill) to assemble and don't need hours to simmer on the stove. This veggie soup comes together in just about 20 minutes, is budget friendly (coming in at a grand total of about $8) and it is something you can feel good about making for your family. Hurray - they (and we) ate vegetables today! Begin by sauteing garlic in olive oil for 30 seconds on medium heat. Add onions, carrots and green (or yellow) beans and raise heat to medium high. Cook for 3-5 minutes until the vegetables begin to soften. Squeeze in tomatoes by hand, breaking them up into smaller chunks. Pour in beef broth and add Italian Herb seasoning. Add shredded cabbage and spinach, and pour in water. Raise the heat to high and bring to slight boil, then reduce heat to medium. Season with salt and pepper - I start with 1 teaspoon of salt and 1/2 teaspoon of pepper, then add more if I need it. Cook for 5-10 more minutes, until the vegetables are soft. Add fresh basil just before serving. Fresh carrots from Verrill Farm. Sometimes I don't even peel the carrots... my little secret. In a soup like this, it hardly matters. I would typically use green beans, but I saw these yellow beans at the market and thought they'd be a great addition. I snap off the ends, then cut them into 1-inch pieces. Start with garlic, then add beans, carrots and onions. After they've cooked a little bit, add tomatoes and beef broth. This can be a little messy, but the texture of hand squeezed tomatoes is worth it. Just make sure you squeeze below the top of the pot so you don't end up wearing it... like I did in this photo. Shred the cabbage by slicing it then cut it in half. Add two cups of water. Cook for 5-10 minutes, or until vegetables are soft. This soup is great with grilled cheese, garlic bread or pizza bread.